Hotel Centre Point is a remarkable resort that offers an excellent and wonderful and unforgettable experience to the tourists. 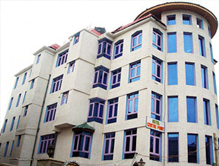 It is located near the famous pristine Dal Lake and Lal Chowk Commercial Centre. The spectacular view of the beautiful Zabarwan Hill surrounding the hotel truly provides a great peace to the mind. It is also a best place to enjoy the holidays away from the chaotic city life. In the company of the near and dear ones, the visitors can get a great opportunity to see the splendid attractions of Srinagar and catch incredible images in the camera. Outstanding hospitality services along with the superior facilities make the resort one of the ideal places to de-stress and unwind. Accommodation This resort in Srinagar provides the superb accommodation facilities to the visitors in the form of 34 air conditioned rooms. The interiors of the rooms are embellished with the unique color and artwork that creates a perfect mood for a memorable stay. Each rooms of the resort are loaded with top-notch facilities such as the attached bathroom, room heater, wardrobe, shower capes, television, refrigerator and so on. 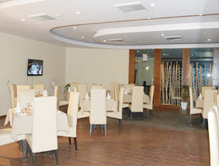 Dinning	The guests during their stay in Srinagar can tantalize their taste buds with the finest cuisines in the ‘Dilshad Restaurant of the resort.’ The various kinds of cuisines like the Indian, Continental, and Chinese provide an amazing experience.